Thrillist and Chobani have launched a content series devoted to our shared belief in food’s capacity to inspire us, bring us closer together, and even occasionally change the world. And if you’re talking about what you believe in, what better city to spotlight than Believeland? A A nyone who has spent more than, oh, say, five minutes with me knows that I harbor an unwavering, some might even argue stridently irrational, love for my hometown of Cleveland, Ohio. The fact that I no longer live along the shores of Lake Erie merely adds an émigré’s fervor to my devotion. Friends and acquaintances regularly forgive (I think?) my constant musings on subjects including but not limited to: the 1995 Indians starting lineup, the 30 Rock Cleveland episode, LeBron James, our underrated art museum (and other cultural institutions), and the safety issues associated with eating Lake Erie perch (many). I’m not blind to the fact that my civic enthusiasm is fueled by a heavy mixture of nostalgia and loyalty. It is safe to say that most of my talk is decidedly hyperbolic. In most cases I embrace the spirit of exaggeration, all the while knowing that it is just that. But when it comes to Cleveland, there is one topic that I know I am never in danger of over-selling, simply because it lives up to all of the praise I heap upon it: the West Side Market. The West Side Market stands not far from the banks of the winding Cuyahoga River in Cleveland’s Ohio City, a neighborhood where turn-of-the-century Victorian homes are surrounded by chain-link fences, its working class history obscured only slightly by the sheen of trendy bars dotting the corners of narrow streets. The Market’s yellow brick building and clock tower overlook squat four-story buildings on the neighborhood’s main commercial strip. Spanning close to the length of a football field, with 44 foot-high arched ceilings, the building’s austere exterior masks the bustling marketplace just beyond its swinging double doors. Inside, more than 75 food vendors hawk their wares; taken as a whole, they constitute an interactive gustatory map of an ever-changing city. Whole suckling pigs and severed goat heads line glass cases alongside stalls displaying towering stacks of bread loaves and expertly crafted Sacher tortes. Throughout the narrow walkways, the gamey odor of uncooked meat fuses with the must of cheese and the sweet yeasty air wafting from the bakeries, making it impossible to tell where one smell ends and another begins. Outside the main hall, along half the building’s perimeter, stand long hallways lined with produce vendors. Sellers yell to catch the attention of passersby, promising the juiciest fruit and the best deals. Loud voices make deals and hands exchange money over mounds of oranges. To walk down the aisles, inside or outside, is to take a trip through Cleveland’s past and present -- you're not just reminded where you came from, you're reminded where your grandparents came from, and where your grandchildren will hopefully one day reflect on an even longer bloodline. It can seem hard to believe, now that the demise of manufacturing and the American middle class seem to be the talking heads’ topics du jour, but the (unfortunately) dubbed “Rust Belt” cities along Lake Erie were once hubs of trade and industry. Now-slighted cities like Buffalo, Erie, and Cleveland boomed in the early 20th century, drawing people, many of them European immigrants, from the East Coast with the promise of jobs and prosperity. 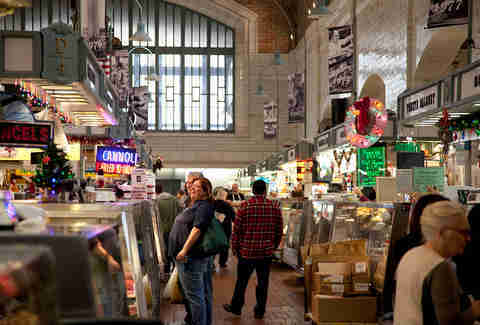 The West Side Market, municipally owned and erected in 1912 to replace a nearby aging market, represented the gastronomic diversity of the city’s new population. To give a sense of the cultural capital the city invested in its new food bazaar, planners hired the same architects who designed the Cleveland Museum of Art. 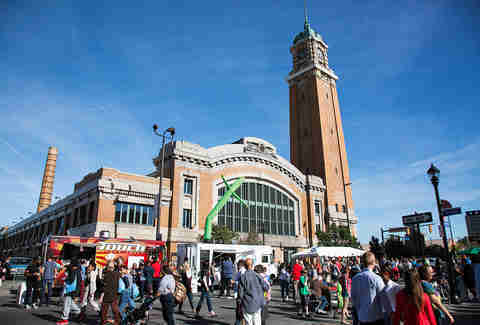 Cleveland's great, Progressive Era effort to create an extraordinary (not to mention affordable) hub for the entire community -- people of every background, from the East Side and West Side -- has proven so enduring, the American Planning Association recognized the Market as one of their "Great Public Spaces" almost a full century later. Also on that list: Central Park. Some of today’s vendors have been working their family’s stall for generations and have helped define traditional Cleveland cuisine -- and at least as much as sports, distinctive local cuisine is essential to a city's identity. 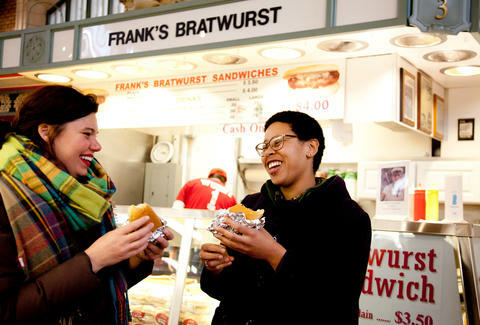 At the northwest corner of the market, wedged between a cheesemonger and pork butcher, Frank’s Bratwurst occupies the tiny, unassuming stall at G-3 (all stalls are assigned a grid coordinate). 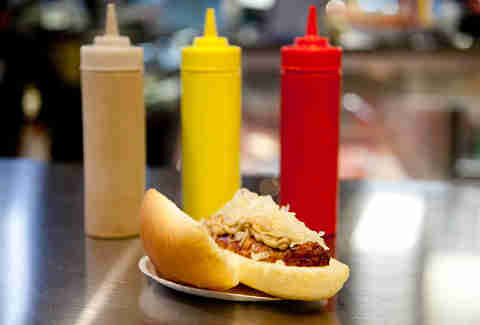 A throng of carnivores is perpetually drawn tightly together reading the bare-bones menu: bratwurst on a hard or soft roll, with sauerkraut (add $.50), choice of mustard, ketchup. The family matriarch takes orders as her sons pivot between trays of warm brats and a pot of ‘kraut. In fewer than two minutes a warm sandwich wrapped, paper plate and all, in tin foil is thrust across the counter. Food has always been a great unifier, and nowhere is that magical gustatory glue more clearly on display than here. Unlike many of its mid-sized neighbors, Cleveland doesn’t have a plethora of signature foods (before you even think it, Skyline is from Cincinnati), but what we lack in numbers we make up for in taste. Take Cleveland Cassata cake, an Italian specialty of yellow sponge cake layered with fresh strawberries and vanilla custard. At Teresa’s Bakery (D-2), it can be easy to overlook the palm-sized rounds of whipped cream-topped cassata cakes amidst tiers of golden cannoli shells (they’re filled to order) and stacks of fresh fruit tartlets. But to those in the know, they’re the kings of Cleveland’s dessert scene -- though of course you should grab a cannoli too, as long as you’re there. Other Market mainstays aren’t unique to Cleveland but are nonetheless crucial to its identity. 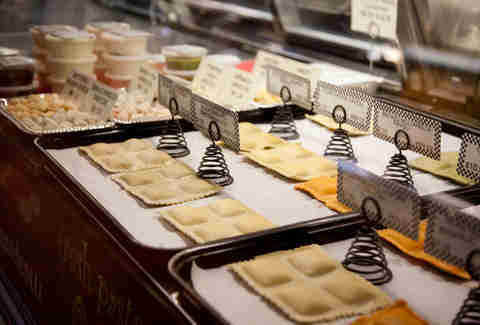 At Pierogi Palace (E5), Ziploc bags of the best noodle dumplings you’ll ever eat, labeled in permanent marker and laid out in disposable lasagna trays, are Cleveland. Renowned for their variety, the Palace’s full range of offerings diminishes as the day goes on -- when they’re out they’re out. Adventurous traditionalists, they’ll stuff just about anything into their handmade pockets, from standbys like potatoes and cheese to “pizza” and blueberries. Irene Dever, the Market’s longest tenured vendor (H-10, H-11), and Meister Foods (A-4, A-5) don’t specialize exclusively on pierogies, but the traditionally flavored Eastern European dumplings they do offer are stellar. Irene Dever’s pierogies, with a delicate dough full of pillowy potatoes, are a particular standout for the Old School pierogi lover. Historically, the Market was the destination of the home cook with many mouths to feed, and many of its best foodstuffs are not of the prepared variety. Not surprisingly, many main hall stalwarts peddle protein; anyone not harboring a deep desire to see how the sausage is made may be better off walking the produce stalls outside. Specialties range from locally sourced (Sebastian’s Meats, G-4, G-5, G-7) to lamb & goat (Foster’s Meats, F-4, F-5); shades of pink and red animal protein seem to be on every corner. At J&J Meats (B-6) pink hues give way the dark oranges and deep reds of smoked meats and jerkies, house made since 1954. Walking past any of these vendors can feel like taking a step back in time, and it is easy to get lost in the balletic rhythm of cutting, weighing, and wrapping. Until a shout from across the counter interrupts your reverie -- what do you want and how much? Nostalgia, the luxury of non-shoppers, is overwhelmed by the clear-and-present dilemma of whether two pounds of thick-cut pork chops is enough for dinner. Even as the multi-generational Market old timers continue to put their stamp on the space, there is an equally strong new generation of purveyors emerging from the craft food movement of the past 25 years. When City Roast Coffee & Tea moved into a bustling corner near the W. 25th St entrance (C1), it was a harbinger of a new generation of shoppers eager to sip lattes while browsing cheeses and bags of French Roast to put in their French presses. Other additions, like Urban Herbs (E2), likewise reflect a growing clientele looking to explore and experiment. The addition of the coffee-sipping, guajillo chile-craving clientele has done little to change the culture of the market, which remains firmly rooted in its immigrant past. This isn’t to say that things are static, though. The Market’s role as a venue for different cultures and backgrounds to showcase varied gastronomic delights makes it a touchstone for the changing face of Cleveland itself. Asian, Middle Eastern, and South and Central American flavors have added fresh vitality to this already diverse Midwestern melting pot. Orale Contemporary Mexican Cuisine (F-6 and F-7) came to the Market in 1999. 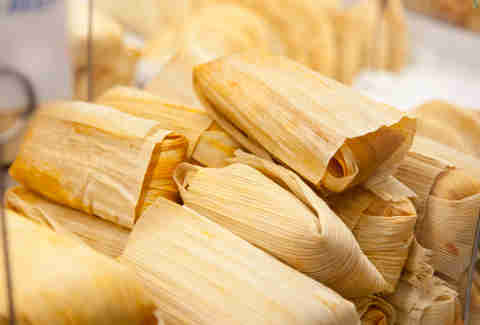 Stacks of golden hand-made tamales sit precariously piled high in foil-wrapped pans, begging to be bought before the tower collapses into the nearby dish of enchiladas. The bright citrusy aroma of cilantro fills the air surrounding the stall, where bowls of every imaginable salsa make a rainbow of flavors. The salsas made the stall famous; its traditional and inventive styles are all sought after by the city’s growing Mexican population, and everyone else who calls Cleveland home. Created to serve a burgeoning population at the turn of the 20th Century, the West Side Market has evolved along with the city into a bustling and diverse space where old meets new. Food has always been a great unifier, and nowhere is that magical gustatory glue more clearly on display than here. It is, and will continue to be, the place that makes me most proud to be a Clevelander.